According to Amazon.com’s new associates agreement, changes are coming, effective next week, May 15th 2014. The people affected the most? People just like me. If you blog about video games and want to earn a living through advertising, it’s time to look somewhere else. 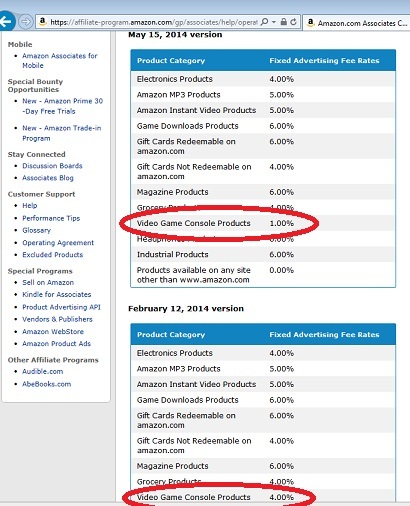 Amazon has slashed their already lowest Fixed Advertising Fee Rates on “Video Game Console Products” from 4% to a meager 1%. Clearly, video game bloggers with successful ad models were a threat to Amazon’s success. (That, to be abundantly clear, was sarcasm). The painful thing to note is that nothing else has changed in their Fixed Advertising Fee Rates. Associates for all other products don’t see a fee-change, but it seems obvious to me that video game bloggers have been able to make a dent in Amazon.com’s income by successfully alerting people to bargains they want to take advantage of via Amazon.com and linking them to the site. With literally 25% of the incentive compared to before, how many bloggers are going to continue plastering Amazon links on their website? I certainly won’t actively work as hard to embed a couple of referral links into an article anymore, and I hope more bloggers are onboard with me. I currently have a side-bar ad for Amazon, which will be gone with the site’s next re-design. If there are enough sales happening that Amazon.com wants to cut the amount of money they pay out, that means there must be a lot of successful referral linking. Would you rather pay out that 4%, or simply not have any of those sales? To drop an Amazon.com Associate’s share to 1%, while all other products remain 4% or higher is down right insulting, and I hope to see a new revenue-sharing-savvy online retailer step up to take their place, soon.